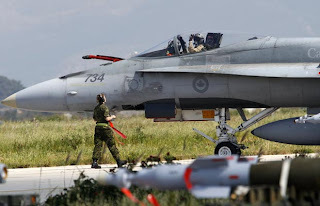 CANADIAN PRESS: Department of National Defence officials have confirmed a report that a NATO aircraft went down over the Republic of Krajnika, and confirmed that the aircraft was a Canadian Forces CF-18 Hornet. "The status of the pilot is unknown at this time, but we do know he managed to eject", stated Major General Dave Hogan at a press conference this evening. "Right now the best intelligence we have tells us that neither Krajnik nor Doldovan forces have made contact with him". Hogan further stated that the terrain where the aircraft is believed to have gone down was difficult to reach by land, and that ongoing bad weather had made an airbourne search and rescue attempt difficult. "Our first priority at this time is our pilot, and we're doing everything we can to locate him and get him back". Canada has been participating in NATO's Operation Overwatch since mid-June, when evidence surfaced that Krajnik government soldiers were conducting "ethnic cleansing" operations against the Doldovan minority. The two sides have been engaged in a brutal civil war since January. Hogan would not confirm that the aircraft had been shot down by Krajnik forces, but pointed out that NATO bombings have heavily targeted the Republic's air defence network, and that most or all of it has been decimated. 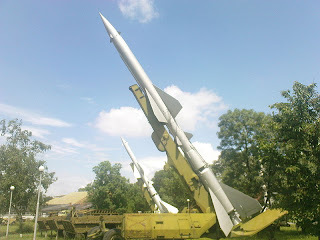 "As far as we know the Republic of Krajnika has no SAM sites left, and if there's still one out there, that's news to us". Complicating the issue is the recent announcement that CF-18s engaged in NATO's action are now equipped with the Canadian-made FEARS technology. The surveillance technology used in the Full-Enhancement Aerial Reconnaissance System would be highly sought-after by China and Russia. A DND official who wished to remain anonymous told Canadian Press that there were concerns that if the Krajnik government managed to obtain the technology, they would turn it over to one of those powers. A secondary concern is that the Krajnik government would keep the system instead, and use it as leverage to obtain advantages in peace negotiations currently underway at the United Nations. To get in on the action, be there at the Ottawa Milsim Coalition's next event, "Eagle Down", on Wednesday, August 24th at Carnage Paintball! Details on the event can be found here. And if you believe this is a real news report, click here.